If you’re “Crazy” about Patsy Cline and want to relax in a lakeside cabin with a stunning view of gorgeous Kentucky Lake, then Camden, Tennessee, should definitely be on your list of must-see destinations. Whether paying your respects to country music legends at the Patsy Cline Memorial, or seeking an off-beat attraction such as the Tennessee River Freshwater Pearl Museum, Farm and Tour, Camden is sure to enlighten and entertain visitors who trek down its scenic roads. In fact, the community offers unique accommodations and attractions that visitors are unlikely to find anywhere else around Kentucky Lake. Here are a few things you won’t want to miss on your Kentucky Lake vacation. 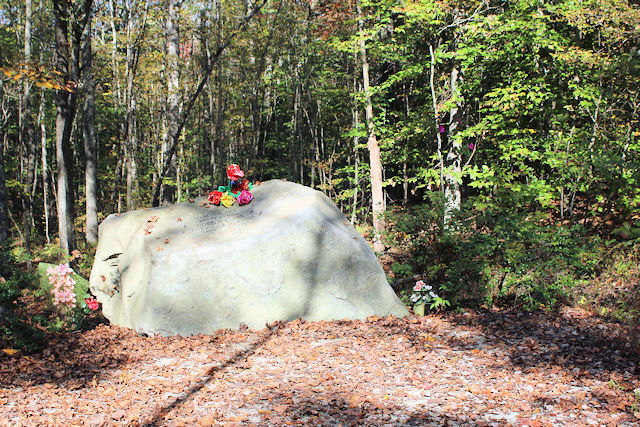 A memorial has been erected at the site where the tragic plane crash that took the lives of three country music legends, Patsy Cline, Cowboy Copas and Hawkshaw Hawkins, and pilot Randy Hughes on March 5, 1963. Country music fans honor the memories of these never-forgotten individuals who brought the world such famed country classics as “Crazy” and “Walkin’ After Midnight” by Patsy Cline, “Alabam” and “The Tennessee Waltz” by Cowboy Copas and "The Sunny Side of the Mountain” by Hawkshaw Hawkins. Quilting has long been a part of the regional heritage of the lands that surround Kentucky Lake. The Quilt Block Trail that winds through Camden and all of Benton County. One hundred twenty three quilt blocks make up the trail. Every block can be easily viewed from the road, making this the perfect event for a Sunday afternoon driving tour of the county. Brochures and maps about the trail are available through the Benton County/Camden Chamber of Commerce. Whether you’re looking for a glimpse of Tennessee history or just longing to spend a few days in nature, the attractions and hiking trails that fill Nathan Bedford Forrest State Park make a great addition to anyone’s vacation. For those who wish to spend the night, the park includes vacation rentals such as cabins and campsites. The site is also home to Pilot Knob, a scenic overlook, picnic grounds with pavilions, fishing holes, boating and even the Tennessee River Folk Life Center. As you might have guessed by its namesake, the park is also filled with Civil War history that serves as a reminder of more tragic times in our nation’s history. This museum and farm is the official site of Tennessee’s freshwater pearl culturing industry. In fact, this is the only freshwater culturing farm in the nation today. Learn more about how the farm came to be in the late 1970s. You can take a walk-in tour of the facility or schedule longer tours that include a catered lunch. You’ll also find all sorts of gems in the pearl jewelry showroom and gift shop. The farm continues to be a working farm, producing pearls that founder John Latendresse dreamed up nearly four decades ago. The farm is located halfway between Pickwick and Kentucky Dam on Interstate 40. If you’re looking for a place to escape to the great outdoors, then a trek to the Tennessee National Wildlife Refuge in Camden will be a trip worth taking. The refuge is home to nature walks, lakeside attractions, open horseback riding, hunting, and boating. Perhaps the most notable attractions are those that draw in nature lovers throughout the year. These include the migratory bird sanctuary and eagle watching roosts where drivers can view from their cars. While Camden is a quaint small town located in western Tennessee, it has a lot more to offer its guests than simply that which is listed above. But don’t take our word for it, come and see for yourselves. There are many things to do in and around Camden especially if you love the outdoors. Fishing, boating, and other recreational opportunities are waiting for you. For those considering relocating to the Camden area, you can get a closer look at the community and also take a look at Camden, Tennessee real estate agencies. You can even view a list of churches in the Camden Area.